Avengers #1-17; New Avengers #1-8 by Jonathan Hickman et al. Marvel’s Avengers and New Avengers comics at the moment remind me a lot of Dragonlance-era D&D, where the whole plot had been worked out in advance and the PCs moved through it with occasional nudging from the GM. It was designed as an immersive, epic, longform experience but also one with very little agency for the players. Their job was to move from set-piece to set-piece while mandated NPCs explained what was happening to them. Some of the NPCs would join their party for a bit, others were more explicitly a voice of the GM: explaining rules or simply telling the characters what they had to do next. Longform storytelling is in fashion at Marvel at the moment – no surprise, when the most-discussed and praised form of storytelling has shifted from the widescreen movie (the form comics tried to capture in the early 00s) to the complex, multi-season TV series. Story arcs are discussed in terms of seasons; new launches explicitly compared to, for instance, Game Of Thrones. These are not bad ambitions – comics, especially mainstream comics, have always been a cultural sponge, it’s part of the reason I can’t stop loving them. Even when the stories are crap you can be interested by the wider stuff they’re filtering, reflecting, getting right or wrong. The stories at the moment aren’t crap – in fact, the turn to longform apparent in Marvel’s most recent relaunch (Marvel NOW!) has showcased a bunch of different approaches to building a lengthy story in a shared continuity*. Some writers like to tell apparently simple stories, showing their full hands later – Gillen and McKelvie’s Young Avengers feels like this kind of comic. Others – Rick Remender’s Uncanny Avengers, for instance – take a more brute-force approach, ramping up the discord and threat levels to operatic, desperate proportions, issue-by-issue, taking the “How much worse can things get?” approach that has been a part of Marvel storytelling since Spider-Man and making it drive the comic along. Brian Michael Bendis, whose Daredevil run in the early 00s was one of Marvel’s first and best takes on the arcs-as-seasons concept, now has a much looser, slower style: his X-Men comics meander enjoyably, their texture quite as important as their events. Jonathan Hickman’s Avengers is the biggest of the lot – three comics a month (two Avengers, one New Avengers), telling aspects of a single story, and about to be joined by a six-issue “event series” Infinity, taking yet another angle. So we’ve had 25 issues and according to interviews we’re only now approaching the first ‘crescendo’ of three. Hickman’s approach to longform – seen previously in his Fantastic Four and Secret Warriors series for Marvel – is meticulous. He works out the ending in advance, and takes as long as he needs to build to it. A Hickman world is a clockwork world – his comics have many moving parts but very few wasted ones. They are often confusing or unsatisfying when you read individual issues, but taken whole his stories become giant, interlocking costumed orreries. Other longform comics storytellers – Grant Morrison, for instance, to pick an example from the mainstream – like to play with narrative and form, shifting times or even realities without warning, making the reader work to uncover plot and thematic connections. With Hickman, the connections are visible and generally explicit – once you have the necessary information, it’s simply a case of paying as much attention to detail as he does. So taken in one or two sittings his Avengers runs feel more exciting, pacier even, than they did issue by issue. Scenes and locations intersect, events become marginally clearer, every issue has its place in advancing the macro plan. All 17 issues of Avengers click together into one overall story – about the Origin Bombs dropped in Issue #1 – and it has a real momentum. As for New Avengers, it has a kind of videogame structure – not the sort of videogame you progress through and explore, but the old-school, Space Invaders sort. The threat – overlapping Earths, one has to go – is basically the same every level, and your options for dealing with it get worse. Eventually it’ll win. That’s been effective too. The series are taking two very old superhero ideas – the uncanny cosmos-level threat, and the heroic moral dilemma – and doing an awful lot of deliberate spadework to make them feel convincing on a plot level, as well as making them slowly dovetail. Which is great, except… that Dragonlance thing. The RPG term for that style of play – fixed macro plot, lots of mandated events, was “railroading”. 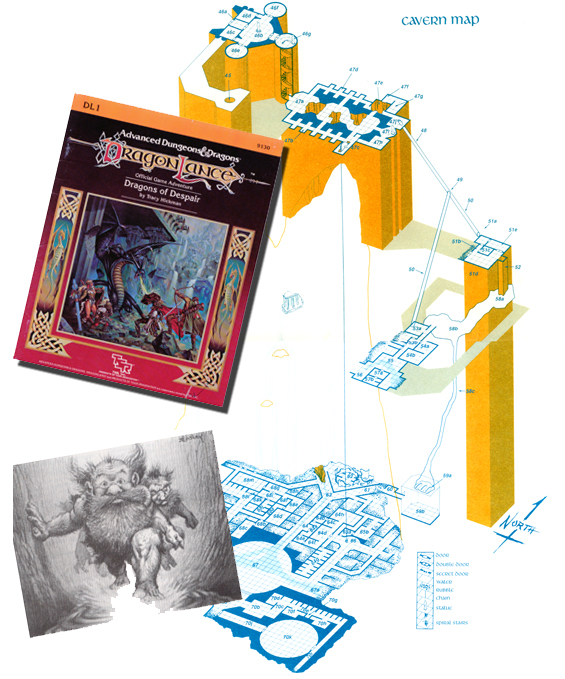 It was very fashionable for a while – mostly thanks to Dragonlance, in fact – and then it got much less so, because everybody realised it wasn’t much fun when your characters had that little agency. And at the moment, in Avengers, the lead characters feel like the PCs in one of those games. The RPG-ish feel is more apparent in New Avengers, and not just because the characters – a bunch of Marvel Universe bigwigs – spend a bunch of time sitting around a table. It’s because Black Swan is SUCH a typical “mysterious NPC”: she knows a lot more than the leads, and she lets them know as and when the action demands, explaining situations in terms of rules. The relationship is a bit more interesting than that, since Black Swan knows that she’s almost the only woman in the comic, and knows how awkward that is, and plays on it. So she’s the voice of the reader, or at least the reader who thinks the lead characters are a bunch of dicks. And also since her advice isn’t “Do this to advance the plot” but “Accept that you can’t advance the plot and get on with blowing up alternate Earths.”. So she’s also the voice of any of the more hawkish readers whose response to the problem would indeed be, “OK, nuke it.” (I told you it was like RPGs). In Avengers, meanwhile, the title characters are pretty much entirely reactive. They spend a few issues reacting to the Garden on Mars, then a few issues reacting to the White Event, then to the Origin Bombs, then to the signal, then Captain Universe tells everyone what they need to do next – sign up most of the previous antagonists as Avengers, the equivalent of getting a bunch of NPCs foisted on the party in D&D. 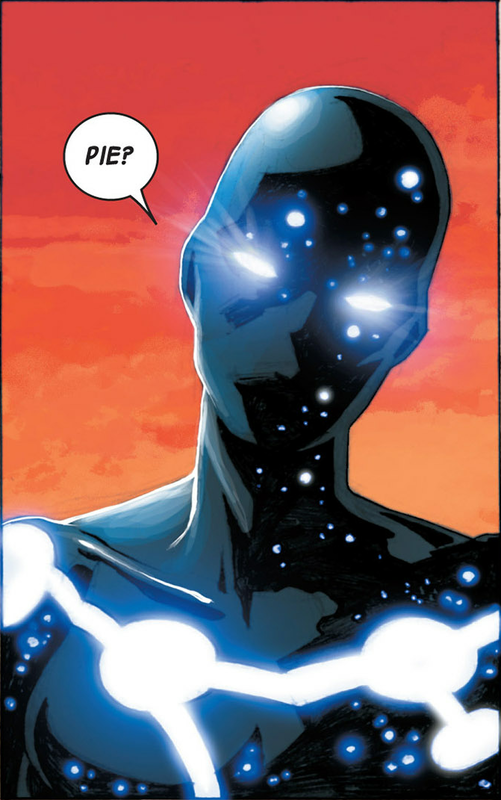 Captain Universe is to Avengers as Black Swan is to New Avengers, in this sense – a mysterious and unreliable plot motor lady. Reactive heroes isn’t anything new in superhero comics, but what it means is that the older, familiar Avengers – like PCs in a railroaded D&D campaign – don’t have a lot of agency. They have character – Hickman is good at dropping in character moments – and they take actions, but their actions never seem to arise from their character, or motivations, or anything other than the plot. Or, if they do – in a fight, for instance – it doesn’t make much difference. In Dragonlance, the PCs would get to kill a dragon, and they would have to work out how. But they killed the dragon because the plot specified a dragon would be killed. And I’m sure that Thor, and Captain America, and Wolverine, will get plenty of awesome action scenes. But will they matter? How much does any of this make Avengers or New Avengers worse comics? Assuming you care about the plot in the first place, it depends how much you trust Jonathan Hickman. If you don’t trust him, you might recall that at least three of his notional Fantastic Four were largely spectators in their own comic. If you do, you might remember that he did better work with Reed Richards, his kids and his Dad than anyone else at Marvel has in decades. And, of course, denying lead characters agency is a very good way to establish a sense of them being out of their depth, or on the horns of a genuine dilemma. The most exciting superhero moments in Avengers so far have been in the last couple of issues, as the Origin Bomb sites become active, and the team seem genuinely overwhelmed and unprepared. So “wait and see” is the verdict – on the one hand, well duh, the story is less than a third finished. On the other, 25 issues is a good chunk, and it doesn’t feel premature to at least be asking this stuff, and noting that the story so far feels less “The Avengers face their greatest challenge” and more “The Avengers do what the GM wants”. I’ve found this incarnation of Avengers deathly dull for most of the reasons you’ve mentioned above. Its all big picture, wiodescreen action, barely any character work (apart from New Avengers which is character work with five of the dullish, most dickish in the Marvel U). Having just read the first edition of Infinity, the spin-off event, the last page reads exactly like the kind of no-nothing shock reveal you might attribute to a lack of agency of the leads. Yeah, also it’s more “premise” than “reveal” – though this is my penalty for reading the pre-publication publicity. As a cliffhanger it felt a bit like the old Doctor Who stories where the title was “[x] of the Daleks” and the episode 1 cliffhanger was a Dalek. It reminds me of reading Bleach (the manga), kind of — casts of thousands in loads of factions pulling in different directions, and then these big unifying plot-driving twists that turn out to be quite simple back-of-napkin pitch type ideas. Which are then immediately followed up by the introduction of another new faction of characters. Started New Avengers with issue #1 and it always made perfect sense. I am the reader thinking everyone is a bag of dicks.